Nintendo Switch Online went live over a month ago. While the paid service is required for people to play games like Mario Tennis Aces online together, it still doesn’t include any way for players to easily meet and connect with one another. As a result, fans have tried to fill that void with their own solutions, the latest of which is a website called Switcher. Switcher lets you import your profile from the popular gaming chat app Discord, select a Switch game you want to play online with people, and then begin searching for other users who are looking to play the same game. It only shows one person at a time, and only includes the information they choose to share, which is often their Discord name, profile picture, and Nintendo Friend code. From there, you can DM the person and meet up in-game. It’s simple and straightforward because that’s all it needs to be. If Nintendo had any big social features of its own on Switch, Switcher might seem beside the point. But the Switch doesn’t have a system like this, and so a few thousand Switch owners have taken to using the fan-made Switcher website to find one another online. “I love Nintendo, but between Nintendo friend code IDs, many games not offering online multiplayer, and the online multiplayer that does exist often being difficult to find new players for, there’s a real issue here that I believe could use some solving,” Switcher creator bezzaton said in the announcement post about the launch of the platform. 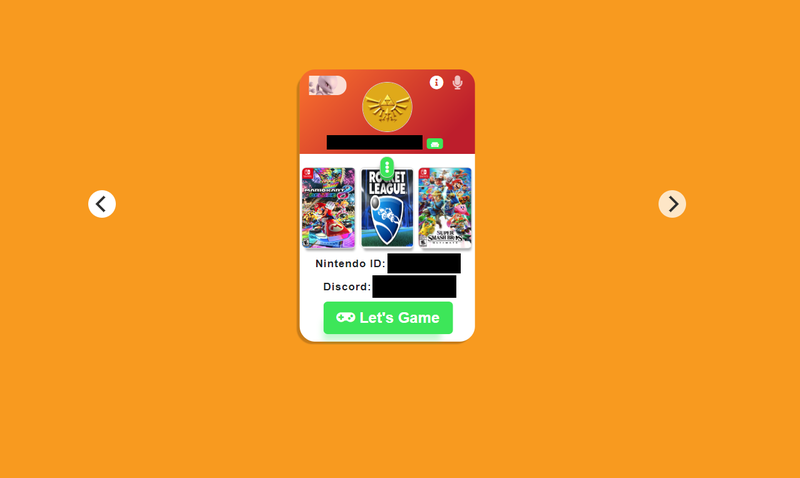 On top of the Discord integration, which does a lot of the heavy lifting, Switcher also serves as a filter that allows people to share Friend codes based on their library of owned games or their proximity to one another. For instance, you can set the number of miles within which you want to Switcher to search for local co-op. This way, people at a Super Smash Bros. tournament or a gaming convention would be able to easily sync up with others attending the same event. Despite its simplicity, the site has gotten a very positive reception in a number of separate posts on the Nintendo Switch subreddit. Some people want an alternative to the Switch’s austere, socially disconnected home menu, and have been thanking Switcher’s creators for rising to the occasion. People can choose to have certain information not shared via the site, like keeping Friend codes available upon request only rather than visible to anyone searching. That said, Switcher does have some issues. Bezzaton actually decided to take Switcher offline for several days when different users brought potential security vulnerabilities to their attention. It was relaunched over the weekend with, bezzaton claims, significantly improved security that utilises a token system to prevent hacked accounts and bot activity. For those who want something more, Switcher exists anyway, and as the Switch install-base continues to grow, it’s possible that other custom-made “looking for group” tools will pop up. Diablo III came to Switch last week and Warframe, a sci-fi MMO, releases later this month. Lots of players already rely on subreddits and Discord to find friends to play multiplayer games like these ones on Switch. Some of Switcher’s initial users said on social media that they’d hoped it might be something like a stripped down version of Miiverse, the original social hub for Wii U and 3DS that Nintendo shut down last year at this time. It’s not nearly that robust, though. If only there was someone out there capable of making a Miiverse for the Switch era.